Most children can readily name their favorite storybook character or superhero. Whether for beauty, brawn, or bulletproofness, this character ranks supreme, embodying all the qualities the child aspires to develop. Growing up, I loved Cinderella. I loved her because she could magically lasso all of the forest’s cutest creatures by simply trilling a c-major chord. I wanted to sing like her, look like her, and fall in love like her. Unfortunately, my voice is small and weak — it sends rats scattering amidst Chicago’s trashpiles. And despite my best efforts, I am not a pinch-waisted supermodel with big hair. To the best of my knowledge, the only thing we have in common is dainty little feet. I’ll take that. Several months ago, Nate told me about the latest Batman video game, due out this October. Since then, I’ve watched him ramp up his Batman consumption. We’ve watched and re-watched Batman movies, cartoons, and mini-series. Last night, he called me to the couch for a demonstration of the various ways Batman can kick, punch, and round-house villains in the Batman app. The brand-new video game arrived on Monday. It still resides in the packaging — not because Nate’s oversaturated with Batman media, but rather because he’s dedicated all of Saturday to playing the game sans interruptions. I married Batman. And he’s way more badass than Prince Charming. 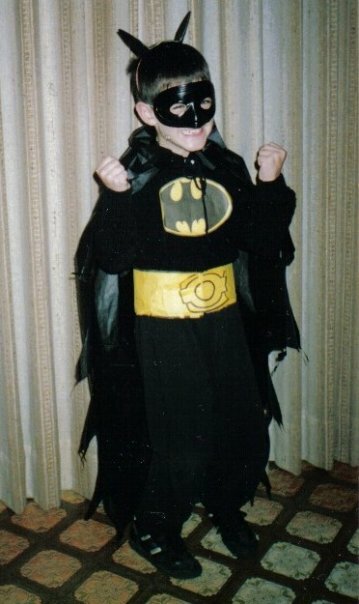 Nate, the Batman (Halloween 1990).